Bunny is getting to the age where playdough would be fun. Except she would try to taste it. Playdough you buy in the store is NOT something I want my 1 year old eating. So I decided to make my own playdough. I looked at the ingredients of playdough and decided to try to make my own recipe. This is what I came up with. Combine flour, salt, oil and water together in a bowl. It starts off mixing really well together, but then it gets hard to mix with the spoon and is a little bit crumbly. That is when you take it out of the bowl and play with it! Knead it together for 4-5 minutes. After 4-5 minutes it should be at a nice consistency, no lumps, no crumbly pieces. Separate the playdough into as many pieces as you need for your food coloring. 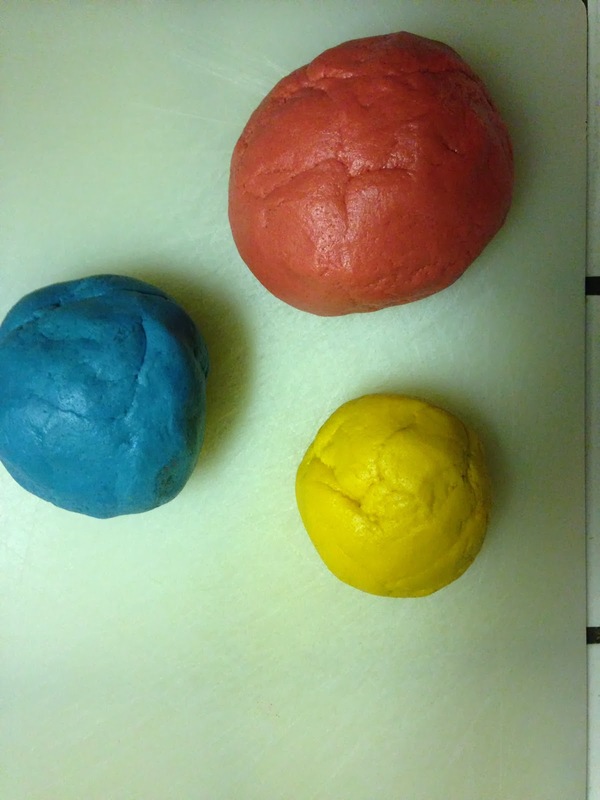 I decided to make red, yellow, and blue so I separated my playdough into three pieces. Add your food coloring and knead again for 4-5 minutes. I did not use gloves and the food coloring stained my hands. I washed my hands 2-3 times before the food coloring came out. Not a big deal to me, but if you don’t want colorful hands, use some gloves. Repeat this process for each color. 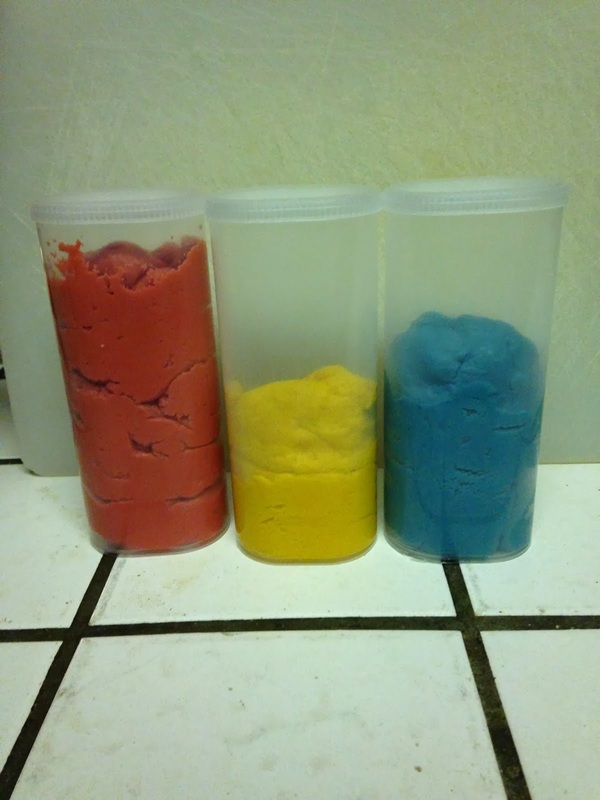 When you are done, store the playdough in an air tight container. I reused crystal light containers. The best part about this recipe is it is fool proof! If your playdough is too sticky, add a bit more flour until it is the right consistency. If it is too dry, add a touch more water until it is nice and malleable. This recipe makes a decent amount, if you are only using 1 color I would suggest cutting the recipe in half. I gave the playdough to Bunny to play with, and sure enough, first thing she did was taste it! It did not taste very good so she spit it out. I have heard about flavored playdough, but I am not sure how I feel about that. Eventually Bunny will play with store bought playdough (at a friends house, school, church, somewhere) and I don’t want her to think it is okay to eat it! I might try to make the playdough smell good, so stayed tuned!